Whether you know exactly what you’d like to do or you just want to get involved and meet people, you can indicate your interest in volunteering for SIGUCCS by filling out the volunteer form. Any questions – just ask a board member for further information. We look forward to your participation! 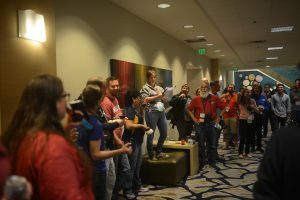 Many who have volunteered at SIGUCCS conferences seek further involvement through volunteering to serve the organization. In addition to the elected officers (Chair, Vice Chair/Conference Liaison, Secretary, Treasurer, Information Director), SIGUCCS has committees that support the Board’s activities. Members of these committees are appointed by the Board. Current committees include: Awards Selection Committee, Communication Awards Committee, Marketing Committee, and Mentor Program Advisors. Serving the organization in one of these capacities will provide you with an excellent professional development opportunity while making sure your SIGUCCS colleagues continue to experience a vibrant professional community. All of the work to make the SIGUCCS Conferences happen is done by a team of volunteers. The SIGUCCS Board selects experienced leaders as conference and program chairs. Other positions are selected by the conference core committee on the basis of known willingness to serve. Typically, committee membership includes a mix of experienced and new people. 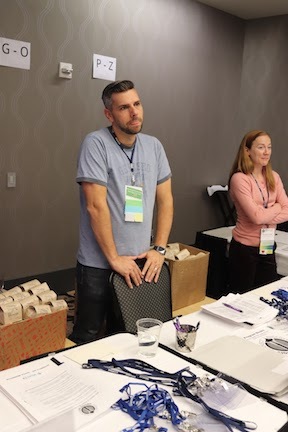 Conference Committee Volunteer roles include: Conference Evaluations, First Timers Coordinator, Local Arrangements Coordinator, Photography, Program Committee (track chairs and readers), Publications, Publicity/Marketing, Registration, Volunteer Coordinator, Webmaster. Volunteers at the Conference also include: session chairs, registration desk volunteers, and conference materials setup.